LED C7 bulbs offer a traditional look for your roof line. 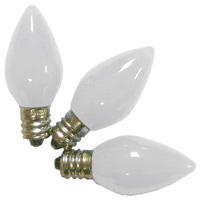 These bulbs are durable, energy efficient and the stringers can be cut to length for a perfect fit. Lens covers are made of plastic and are designed to look like old traditional ceramic bulbs. The SMD LED is brighter than traditional 5-led bulbs, yet uses less energy.